Two days of adventure, white water and sun. 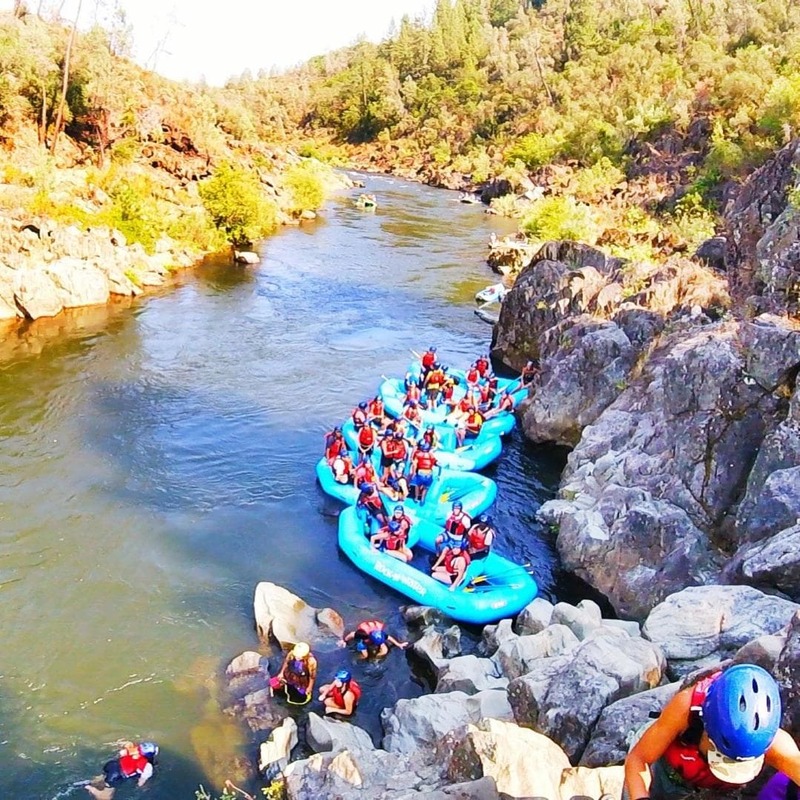 We’ll spend 2 days of Class III river rafting on the South Fork of the American River. 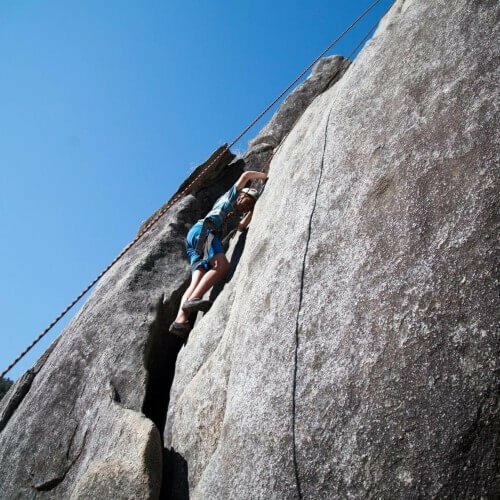 On one day we will adventure on the Lower section, leaving after enjoying lunch in camp. On the other day we will explore the Upper section of the river starting first thing in the morning. We will have lunch on the side of the river and finish at our riverfront campground in the afternoon. 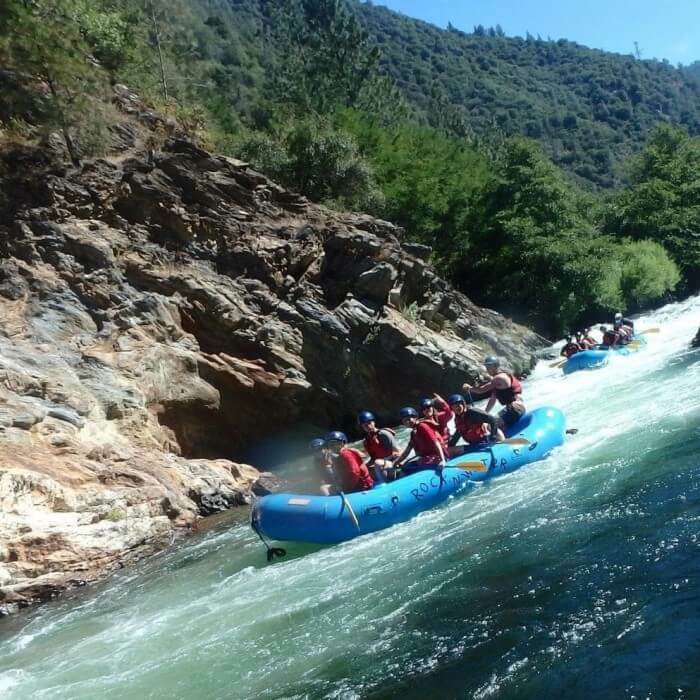 High school groups can upgrade to rafting on the Middle Fork of the American River class IV California rafting on the Ruck-A-Chuck for an additional $32/person per day. Each day on our adventures, we’ll experience the beauty and strength of the American River that God has made. We’ll challenge ourselves physically, to grow in our Christian faith and build lasting teamwork skills. Among other things your group will take part in quiet times, campfires, exploring and rafting. My wife and I had an amazing trip! The Rock-N-Water team did an awesome job serving us! The rafting was great! The food was delicious! We would definitely recommend a trip with Rock-N-Water! Rock n water was great. The guides were both professional, fun, and spiritual. The property had lots to offer for activities and for good times with Jesus. We happily recommend this for churches. It was amazing! We’d definitely go again, and recommend it to anyone! It was a great experience! We rarely get to spend a weekend alone and to be able to do that and then be surrounded by other youth ministry couples that just understood what we go through was incredible. Rock-N-Water was one of the best two-day camp experiences I’ve ever been a part of. My wife and I had the best time hanging with other youth leaders, spending time together and experiencing the beauty of Creation. The river was awesome. We will definitely be coming back! This trip was one of my favorite trips of all time. It was refreshing for my marriage to reconnect with my wife and refreshing for my soul to breathe in the Lords creation and spend time with Him. Thank you for what you do! 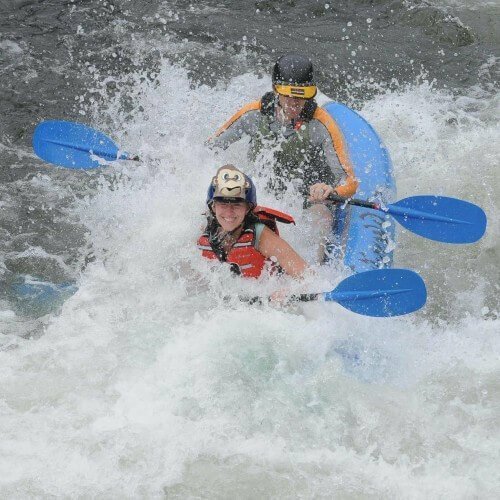 Rock N Water is the best faith based rafting/camping experience around. The staff there is super dedicated to safety, fun and Jesus. The food was great and they did a wonderful job of addressing dietary needs of my students and parents! I loved my retreat at Rock and Water! I had an amazing time and all the counselors were super nice! Felt so at home and cared for all while having lots of fun too! It was an awesome experience in all aspects. To explore God’s creation and grow closer to Christ during our stay was priceless. We will definitely be back for more and will share our stories with friends! We were welcomed as soon as we stepped door out of our car and it never stopped. 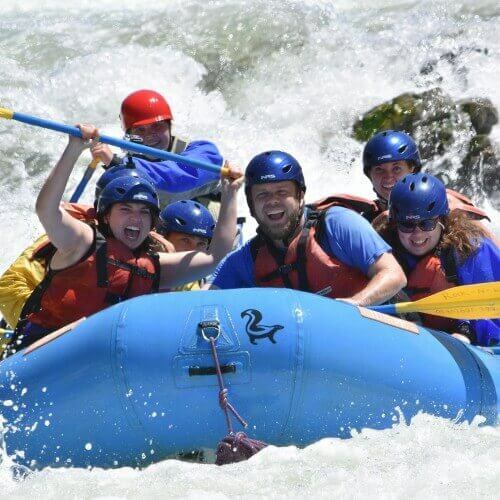 The staff and owners were accommodating, kind and sincere, besides being very skilled in the river. The water was exceptionally high when we went and we never felt unsafe. So much fun!! We had another amazing trip! The staff where very heartwarming and friendly! I had an excellent time. I really appreciated how concerned they were for everyone’s safety. I really enjoyed this camp. The staff was extremely nice and excited to see us from the moment we arrived, to the moment we left. I would definitely recommend this camp to others, and the food was good too. I loved it. Every second. Thank you from the bottom of my heart for facilitating, coordinating, and serving at this event. I appreciate the Rock-N-Water staff more than I could ever say, and I love this camp more than most. Thank you again. Praying for continued to ministry and blessing for this amazing camp. 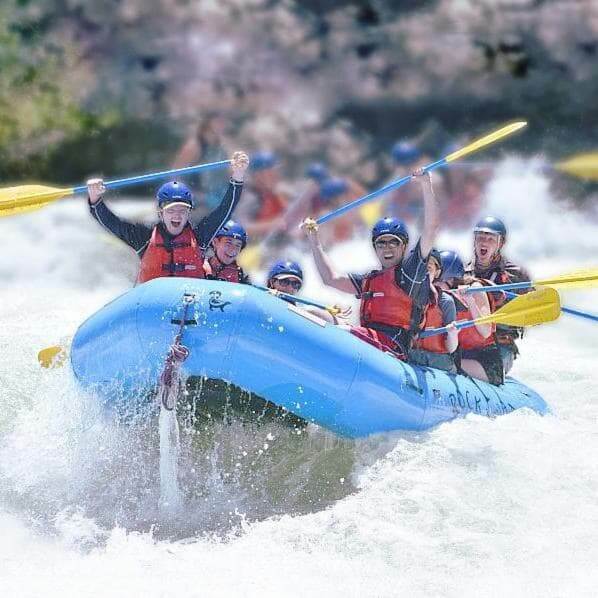 I had the best experience, not just because I was trying to hold on for my life during the rapids, but the staff and the people we were surrounded by made my experience much better! My experience was amazaing! The guides we great people, and well trained. The food was great and the staff were great people to be around. This would definitely be a place to take the youth groups to. We had an outstanding experience at the youth pastors’ couples retreat! The location was beautiful! The amenities and food were outstanding. The staff was friendly, courteous, knowledgeable, and downright Christ-like in their approach and treatment of our entire group. Well-worth the 7 hour drive from SoCal to be a part of this life-changing experience. We definitely hope to return! We had a wonderful time! What a blessing it was! Clean facility, welcoming atmosphere, delicious food, nice bathrooms, encouraging campfire times, great community. The best, everybody was very helpful, knowledgeable and Christian. Rock n water creates the ideal environment to connect with God through nature. I was inspired, refreshed, and encouraged to continually seek God’s presence outside the walls of my daily life. It was wonderful. We enjoyed the camping. The food was outstanding. 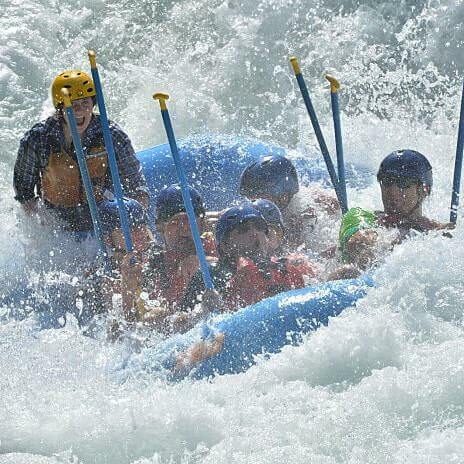 The rafting was thrilling! And the interaction with the other youth leaders was priceless. Thanks againf for your very kind and generous offer for us to come. Very friendly staff. Good food that was prepared throughout the day. The campground spot walk to the eating area was near, which I liked. The camp area was clean. 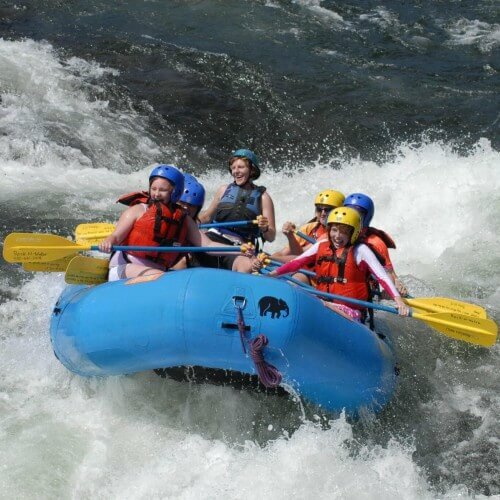 The instructor for the raft was friendly and knowledgeable about the instructions when rafting. It was great going out doors camping and enjoying the great outdoors that God gave us. 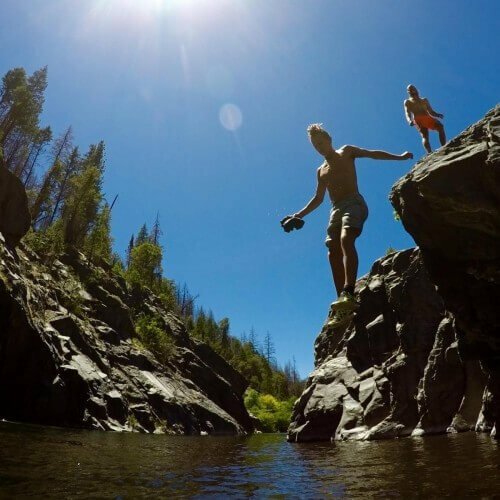 From hiking to white water rafting to sleeping under the stars nothing gets better than that. The staff is personable, works hard, fun, funny, and deeply cares to make sure we are having the best time possible. Very good. Thanks for the amazing time with Avery – he is the best. We took one of the Hot Shots photo of us and blew it up for the entry way to our worship center! I’d love to send a digital copy to Avery, how can I do that? Very enjoyable, relaxing, exciting, and informative. Thanks for everything. We had a great time rafting. 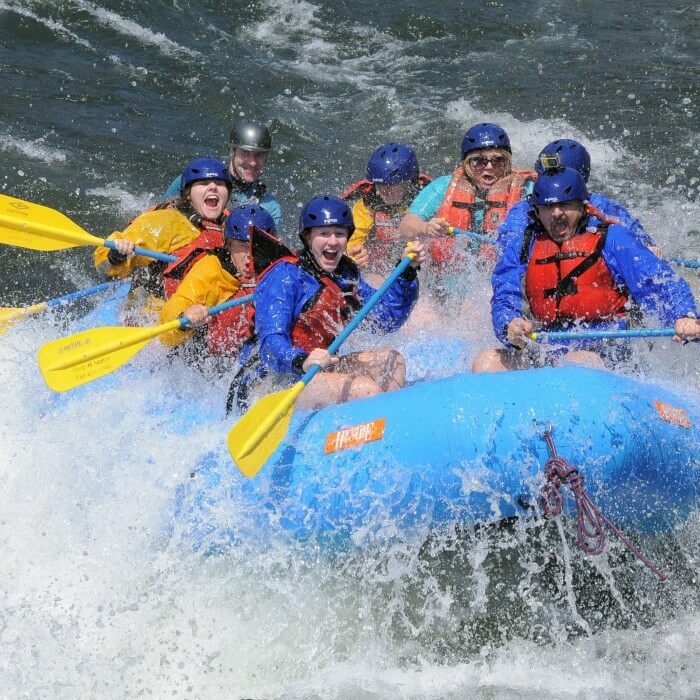 The fellowship was excellent and the rafting guides were entertaining. this was a wonderful experience.When we arrived we were a little nervous as we are not avid tent campers. we were welcomed and our nervousness quickly turned to excitement. The staff was awesome including Anna, Stewart(guide on lower) and Joe (guide on upper). my wife and two teenagers loved the camp and we are planning for next year return trip. Food was good but could be kicked up a notch for the adults. great crew, awesome rafting experience, good food, even my unchurched son was happy with the weekend as he felt he was not forced to participate in any activity and was allowed the space he desired, he liked the people, the staff at r-n-w is one of a kind…the Asselin family was kind and loving, Ellen was a great leader and made us feel safe in the river with her calm yet strong leadership, Zecgariah was very interactive during day 1 of our rafting trip, I enjoyed not knowing anyone else except my family members at the beginning and getting to know awesome people and kids….we will definitely share r-n-w with friends and family. thank you! Rock and Water was so much fun! The staff was so kind and welcoming! We definitely recommend going! We had a really good experience with Rock-N-Water for the youth pastors couples retreat. We felt very well taken care of and appreciated. Thank you so much for offering such a wonderful opportunity for us to spend with our spouse in God’s creation. 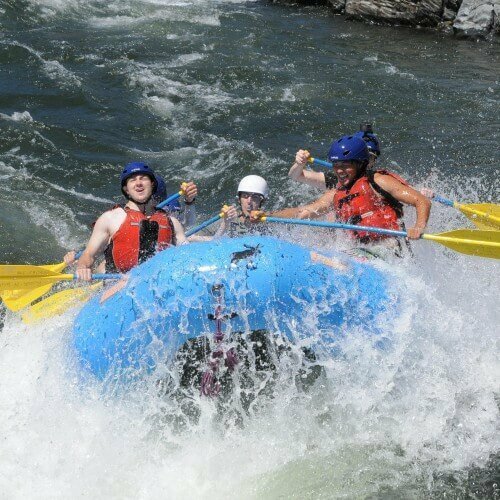 The rafting was super fun and a very bonding experience with the other couples. The campfire sharing was nice and bonding as well. So were the activities and games. It was all well organized and ran smoothly. It was also a great opportunity to learn about Rock-N-Water and the great ministry you have. This was such a great way to build a great relationship between pastors and Rock-N-Water. This weekend achieved a lot of good goals – for us to enjoy time with our spouse, with other couples, in God’s nature, to have fun camping and rafting, and for us to get to know the ministry and opportunities of Rock-N-Water. We really appreciate Craig and the staff for serving us that weekend. Thank you! Super awesome time. My wife and I were about to enter the most challenging season in our collective time in ministry. This retreat was just what we needed to tighten our bond to each other and the Holy Spirit. I will always remember to seek God in the setting of His creation as often as possible. It was a great experience and I NOW will plan to have a HS Sr. graduation trip in the years to come Starting in 2017. I have already mentioned this trip to a few students and they are excited. We loved it. We were greatly impressed with the love and care we received from the staff and how much fun our experience was.